The first iPhone saw release in 2007 with a fairly barebones selection of apps, none of which were made by outside developers. That changed when Apple opened the gates to developers a year later with iPhone OS 2.0, invigorating a sector and forever changing what it meant to be an "Apple developer." The App Store officially launched on July 10, 2008, after it was announced the previous fall; the first software development kit was released in February of 2008. When the first-generation iPhone arrived in 2007, it came with apps, but all of them were made by Apple. It had Mail, Safari, iTunes, Photos, Messages, Visual Voicemail, weather, camera, the calendar, the clock, and a few others that were Apple's own, without any non-Apple apps, or user choice for alternative versions. According to Walter Isaacson's biography of Jobs, the tech guru was opposed to allowing third-party to run natively on iPhone — and when pressured to do so by developers and others, he had a simple answer: Develop your own web apps that will work on the new platform. "The full Safari engine is inside of iPhone," Jobs said at WWDC in 2007. "And so, you can write amazing Web 2.0 and Ajax apps that look exactly and behave exactly like apps on the iPhone. And these apps can integrate perfectly with iPhone services. They can make a call, they can send an email, they can look up a location on Google Maps. And guess what? There's no SDK that you need!" Developers in attendance didn't exactly rise to their feet with roaring applause. Instead, they gave the equivalent of a golf clap, a rare miss for a "Jobsnote." However, after the backlash from developers continued, it soon became clear that keeping native apps out was not tenable for long. Others in the know disagree with Isaacson's story and contend third-party apps were always on the iPhone roadmap; Jobs and company were simply not comfortable with releasing an SDK at launch. In any case, web apps came first, with native software to follow. Apple announced the release of an SDK in October of 2007, with the software shipping out to developers the following February. "Let me just say it: We want native third party applications on the iPhone, and we plan to have an SDK in developers' hands in February," Jobs wrote in a letter that October. 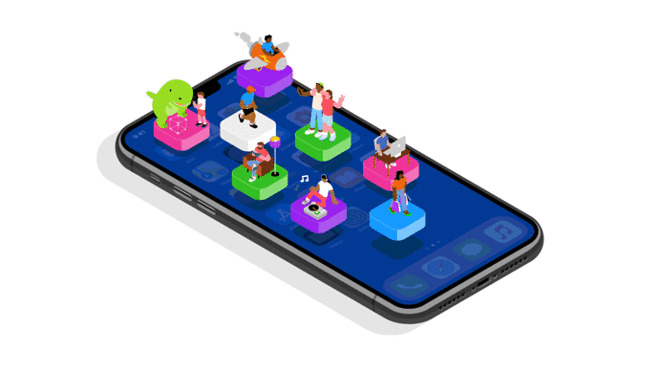 "We are excited about creating a vibrant third party developer community around the iPhone and enabling hundreds of new applications for our users." Jobs, in adding that the SDK would also allow the creation of apps for the iPod Touch, ended the letter by promising that "we think a few months of patience now will be rewarded by many years of great third party applications running on safe and reliable iPhones." Apple also announced that developers could set the price of their own apps — including free — with the devs keeping 70 percent of sales revenues. The SDK was officially released on March 6, 2008. Less than a week later, Apple announced that the SDK had been downloaded more than 100,000 times in the first four days. Shortly after the iPhone 3G was released, the App Store officially came online on July 10, 2008. There were 500 apps available at launch. The store was a hit with consumers almost immediately, as it was easy to use and figure out even for less-tech-savvy customers, and it brought life-changing technologies in all sorts of realms. Indeed, the App Store very soon after its launch changed life for its users in all sorts of ways, providing them with apps for fitness, gaming, navigation, book-reading, e-commerce and much more. The live-streaming revolution, with Netflix leading the way, was made possible by App Store apps. And thanks to Tinder and other geolocation-based apps, dating was never the same again. Changes would come to the Store as time went on. When the iPad and later the Apple Watch came along, apps were part of those as well. Apple introduced in-app subscriptions for the first time in 2011, and a huge redesign debuted in the summer of 2017. Ten years ago, the App Store started a revolution that has changed our world. For hundreds of millions of people, in ways too many to count, life is better because "There's an app for that!" Happy 10th birthday, @AppStore! There were 500 apps available at the time of launch, a number that would grow to 3,000 by that September and 15,000 by the following January. The growth was exponential in the ensuing years, as the App Store hit 1 million apps in the fall of 2013, and reportedly reached 2 million earlier this year. Just as the iPhone has grown from a product that didn't exist 11 years ago to something that's a ubiquitous part of life in the 21st century, apps are now an indisputable part of most people's everyday existence.